Home › Podcast Episodes › TMN023 – Watson Wu. He records tanks. TMN023 – Watson Wu. He records tanks. BTW, you can read all about Watson Wu’s latest doings, as well as check out his awesome SFX libraries at WatsonWu.com. Well, it’s been a very long but productive week, and I’m so glad we got to sit down (aboard Jacie Sails, no less!) with field audio guru (and musician, sound designer and just darned cool cat in general) Watson Wu. 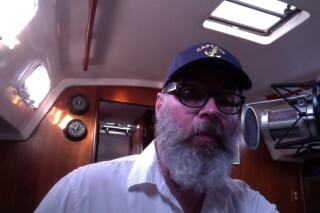 ANYwho, [of course] Watson recorded the dinghy ride to and from the Gulfport dinghy dock; and once back aboard, we got underway, and recorded a variety of sailing, motoring, and motorsailing sounds…a few of which you can hear during the podcast. As we got back to the marina, Watson pointed out that some water was coming out of the starboard side: The bilge pump was running. Turns out that the gentleman that replaced the exhaust riser on Jacie Sails‘ 30 horsepower Yanmar diesel engine apparently didn’t tighten one of the hose clamps very well. As a result, the raw cooling water was flooding the engine compartment. Thankfully, the raw cooling water was at least getting to the engine before leaking out. However, if my buddy Capt. Dave hadn’t drilled a drain hole for the engine bilge last time I was here, we might have had a cabin full of expensive audio gear…sloshing with salt water. Ah, well…all in a day’s work! Here’s a sample of one of Watson’s weapon recording sessions. You can see much much more on his YouTube channel. BTW, @watsonwustudios, this is why the water leak. Hose to the exhaust riser came off. (And btw, if Capt. David hadn't drilled a drain hole from the engine bilge the last time I was here, we would have had salt water all over the cabin floor. ‹ Watson Wu is coming for you. The sound of 12 pound cannons and Tchaikovsky. Mr. Wu. ain’t right! or is he? This guy not only does sound for movies but he should be acting in productions as well. I loved this episode. Watson Wu was so inspiring in that he mentioned starting small and gradually working your way up. He is truly the American Dream personified. Such talent and humility. Nice to hear high quality sounds From Mr. Wu. I dated a sailor once and accidently shot him in the foot with a Colt. Small world.